An alarming report was released on Thursday after the FDA was forced into admitting that a chemical they have “approved” to be safe in our food may be mentally altering humans to kill. 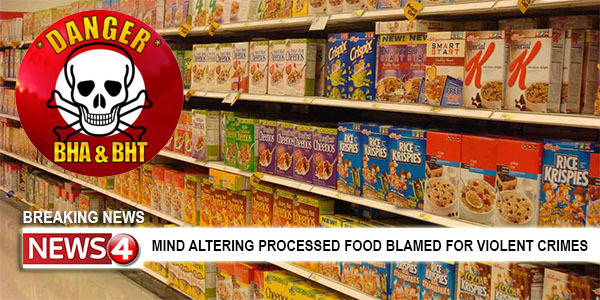 In the wake of much violence and insanity in the United States, several universities have led studies to look into the processed food being produced by corporations and have come to a disturbing conclusion. The one chemical that lead the study was Butylated Hydroxyanisole. Butylated Hydroxyanisole was fed to mice and chimpanzees with the end result being disastrous. With over six months of rigorous testing, 190 of the 215 animals tested killed each other in brutal assault. The lab mice fought to the death by killing the other mice in their sleep with their teeth. The chimpanzees use more “hands on methods” of strangulation and suffocation. All in all, the end results were brutal. Although the FDA admits to the possibility of Butylated Hydroxyanisole being mind altering, they say they will begin their own testing and determine the future of this chemical through their own research. In the mean time, it will be up to all Americans to educate each other about these findings.